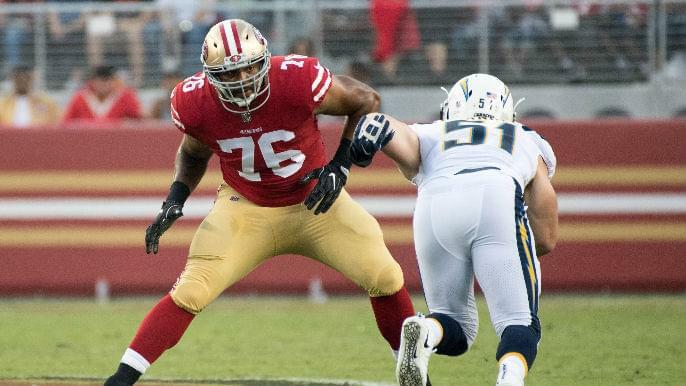 The 49ers have released backup offensive tackle Garry Gilliam, the team announced Wednesday morning. Gilliam, 28, joined the 49ers prior to the 2017 season after spending the first three years of his career with the Seattle Seahawks. He appeared in 24 games but started just one, in 2017, in two years with the 49ers. Last year, Gilliam signed a two-year, $7.75 million extension. The swing tackle was scheduled to make about $5 million in 2019. Gilliam’s release opens an opportunity for Shon Coleman, whom the 49ers acquired from the Cleveland Browns prior to the 2018 season in exchange for a seventh-round pick. With Joe Staley, who will turn 35 by the start of the 2019 season, entering the final year of his contract, it’s likely the 49ers will add another offensive tackle to the room, via the draft or free agency. Gilliam is the second, and likely not the last, 49ers veteran to be released as the team frees up cap space and give opportunities to younger players in waiting. Last month, the 49ers parted ways with 31-year-old nose tackle Earl Mitchell. D.J. Jones, a sixth-round pick in the 2017 draft, is his immediate successor. The 49ers will have to make decisions on whether to retain Pierre Garcon and Malcolm Smith, two expensive veterans who have struggled to stay healthy throughout their two years with the 49ers. Garcon is scheduled to earn $6 million next season. He regressed from 2017 to 2018, logging 24 catches for 286 yards and one touchdown in eight games played. He missed the final eight games of the season with a knee injury. If he is released, Kendrick Bourne, who led all 49ers receivers with 487 yards in 2018, would likely succeed him as the starting “Z” receiver in Shanahan’s offense. Smith is scheduled to make about $4 million in 2019. He missed all of 2017 with a torn pectoral. He battled achilles and hamstring injuries throughout an injury-plagued 2018 season in which he played in 12 games and started just five. The 49ers ultimately found production from rookie middle linebacker Fred Warner and second-year weak-side linebacker Elijah Lee, particularly down the stretch of this past season. The 49ers, projected to have around $70 million in cap space, enter an important offseason on the player market. Jettisoning expensive, expendable veterans has been the team’s first step.